OSAKA - Gamba Osaka, one of the original J. 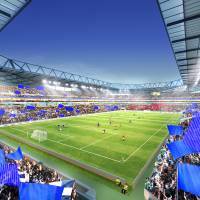 League members, will move into a brand-new stadium as early as 2016. And their new house will be built in an unprecedented way. The Kansai club tried to erect it through fundraising and smartly capitalizing on national subsidy systems, instead of relying on its local administrations for financial expenditures. In 2010, the club launched a fundraising organization and the project kicked off in earnest. As of Thursday, it had collected roughly ¥11.3 billion of the ¥14 billion construction fees. The majority of the money has been provided from companies, including Panasonic, one of Gamba’s biggest sponsors. Led by the Kansai Economic Federation and its chairman Shosuke Mori, ¥8 billion has been contributed for funding so far. Meanwhile, ¥3 billion of the grant-in-aid from toto, J. League’s lottery, which is operated by the Japan Sport Council, was also huge. Tomomi Honma, who works for Gamba’s marketing department and is in charge of the stadium construction project, told The Japan Times that the sport-promotion money out of toto had previously been used for stadium repair projects, but the club successfully received the approval for the brand-new stadium after a series of negotiations with the JSC. And although the amount is much smaller, individuals — the majority of them are presumably Gamba supporters — have donated a total of about ¥280 million with hopes of seeing the new castle, which will be put up where the team’s practice field has been located, south of its current home Expo Stadium, in the Expo Commemoration Park. Being able to use another national system, “furusato nozei,” (hometown tax payment) might have worked for boosters. Under that system, those who donate money for stadium construction costs, will receive tax breaks. The inexpensiveness of the stadium construction, which began in mid-December, is also unprecedented in Japan. It is scheduled to have 40,000 seats and usually the cost would be much higher to make something that size. For instance, it cost ¥19.3 billion for Kashima Stadium (about 41,000 seats) and ¥29.3 billion for Toyota Stadium (about 45,000 seats). 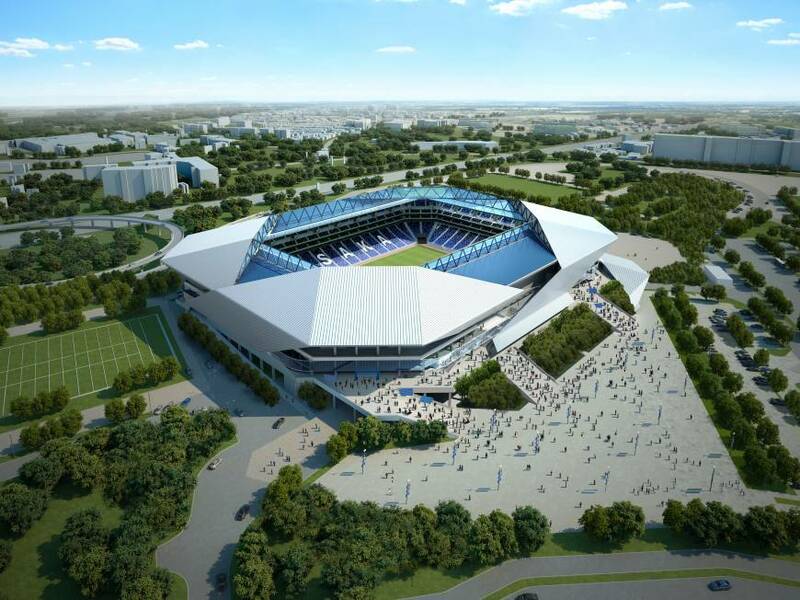 So the low cost for the new Gamba stadium is almost revolutionary and could change the notion for brand-new sports stadium construction in Japan. Honma said that it was possible because the stadium, which is being constructed by Takenaka Corp., will not be built by a local administration and has been designed by the operator (Gamba), it only adopted what it really needed, omitting unnecessary things. But building it at a low price doesn’t mean that it will look cheap. Honma said that project members flew over to Europe to observe more than 10 stadiums, including BayArena of Leverkusen, Veltins-Arena of Schakle 04 (both Germany), Old Trafford of Manchester United (England), Philips Stadion of PSV Eindhoven (the Netherlands) and St. Jakob-Park of FC Basel (Switzerland). 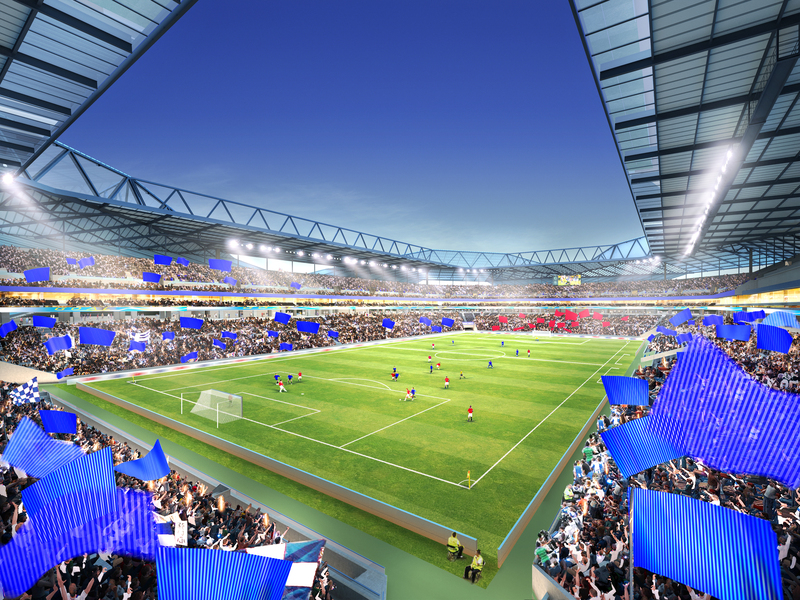 It should give some inspirations to the new stadium for Gamba, which has been promoted to the top division for the 2014 season. This stadium project is receiving high expectations from Japanese soccer circles, not just Kansai and Gamba. In fact, names of some of the influential soccer figures are listed as board members for the fundraising organization, such as former J. League chairmen Saburo Kawabuchi and Kenji Onitake and current chairman Kazumi Ohigashi. The stadium will be a single-purpose one for soccer, but will be intended to have other functions on non-game days. Honma said that the club hopes it will be a place for local residents to assemble for meetings and festivities. In addition, it will also serve as an emergency evacuation facility for nearby residents while being a distribution center for supplies when a serious disaster occurs. Luckily, in the Expo Commemoration Park, a huge shopping mall, said to be biggest one in western Japan, is also scheduled to be built, about the same time as the stadium’s opening. So, thanks to the upcoming attractions, Gamba officials expect more people could flock to the area. But they can’t be overly optimistic about the stadium project yet. They still need to raise a significant amount of money to reach their financial goals. The budget is ¥2.7 billion short of what’s needed to complete the stadium project. It is currently in its third fundraising period, which will end on March 14, 2014. If all of the ¥14 billion isn’t raised, the stadium won’t be full-spec and some things could not be attached, such as the roof and jumbotrons. 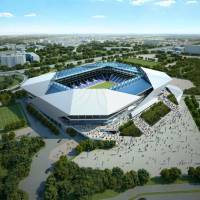 After the completion of construction, estimated for the fall of 2015, the new stadium will be donated to Suita, Gamba’s franchise city. Honma said that the club seeks to games for a possible future World Cup and the 2020 Tokyo Olympics.